« Eye View Business Eastman Kodak To Declare Bankruptcy, Why Wait? 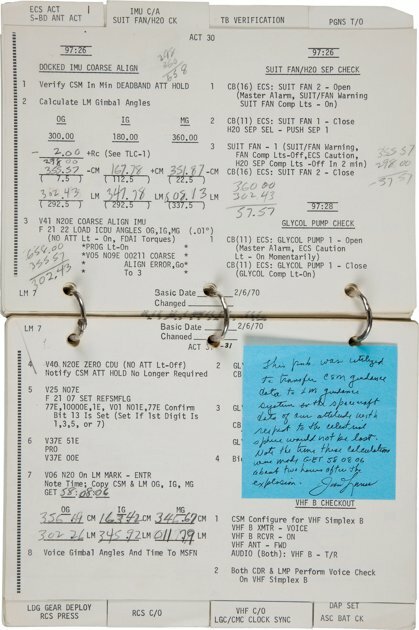 NASA is questioning whether Apollo 13 commander James Lovell has the right to sell a 70-page checklist from the flight that includes his handwritten calculations crucial in guiding the damaged spacecraft back to Earth. The document was sold by Heritage Auctions in November for more than $388,000, some 15 times its initial list price. The checklist gained great fame as part of a key dramatic scene in the 1995 film “Apollo 13” in which actor Tom Hanks plays Lovell making the calculations. After the sale, NASA contacted Lovell and Heritage to ask whether Lovell had title to the checklist. Greg Rohan, president of Dallas-based Heritage, said Thursday the sale has been suspended pending the outcome of the inquiry. The checklist, he said, is being stored for now in the company’s vault. NASA refuses to allow Lovell’s earned income credit for his submitted care of dependents calculations. This entry was posted on January 6, 2012 at 8:18 am and is filed under Uncategorized. You can follow any responses to this entry through the RSS 2.0 feed. You can leave a response, or trackback from your own site.